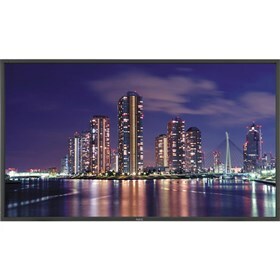 The NEC P552-AVT is a 55" professional-grade LCD display that offers industrial-strength for the most demanding digital signage installations. This display has 1920 x 1080 resolution that displays incredibly clear imagery and features SPVA panel technology along-with NaViSet software solution. The TileMatrix technology allows you to build a video wall up to 100 displays to maximize impact with audience, while monitoring the network from a remote location. The carbon footprint meter enables responsible use of the display conserving green gas emissions in real time. The P552-AVT feautres Smart sensing technology that automatically detects your work conditions to determine proper display brightness with ambient light sensor. The built-in ATSC digital tuner allows for high-definition broadcast capabilities and the built-in expansion slot supports open pluggable specification. This monitor features 178° horizontal and vertical viewing angles and brightness of 450cd/m2. The NEC P552-AVT has many exciting features for users of all types. See the NEC P552-AVT gallery images above for more product views. The NEC P552-AVT is sold as a Brand New Unopened Item.